Ignition Casino could be the big hit of 2019. Like the other casinos operated by the same group, Ignition is not only US-friendly, they are US-only – meaning players from around the world will need to look elsewhere. This page covering the best casino sites will give you plenty of options. Back to Ignition, where several things stood out for me as soon as I logged on. First up, the welcome bonus (a generous 100% match to $1000) requires a very reasonable 25x combined play-through to clear. For most table games (not roulette or the 1 or 2 deck blackjack variations) the weighting for clearing your bonus is a huge 60%. This compares with 25% tops at other US friendly casinos. It is not just table game players that will benefit, there is an eight tier loyalty program with big increases in rewards. There are also weekly bonuses which could rival the welcome bonus. If the sister sites Bovada and Slots.lv are anything to go by, the promotions will be good too. Check out the latest offers now at www.ignitioncasino.eu! The software is online only, and the games all adapt to the size of your screen. If you are logging on from your phone then make sure you test the table games first – some work better than others at with smaller screens. 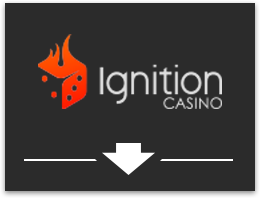 Ignition Casino use a mix of Rival Gaming and RealTime Gaming products. Most of the table games are from RTG. These are solid without too many frills graphically. At one point RTG set the standard for casino table games. These days you can still feel the quality, though other software houses have smoother and better looking versions. All the classics can be found including poker variations, blackjack, roulette, craps, baccarat and more. Slots are a mix of RTG and Rival titles. Rival come out on top for me, at least in the titles for the last 5 years. The majority of games are 5 reel video slots, most of which have extra features and break out bonus games. The list includes the Rival Gaming iSlots, which have progressive storylines and bonus features – some of these even have sequels that continue the story into a new game. You will also find the ‘reel series’ games from RTG. These also have bonus games (usually free spins) though are more on the solid side than the fancier and more varied Rival numbers. Many RTG slots are tied to their progressive jackpots. These drop randomly, regardless of the symbols on the reels. You’ll also find Video Poker, keno / bingo games and scratch cards at Ignition.eu. As I mentioned in the introduction, the 60% weighting given to table games is the best you’ll find out there. If you are US based and enjoy table games, then I’d certainly recommend grabbing this offer before it is pulled! The 100% to $1000 welcome bonus is average in terms of play through, with 25x the deposit + bonus amount before this is cleared. Slots clear at 100%, and you should keep in mind that some table games do not count at all. Promotions should be hot at this casino, if the lead set by the other sites from the same owners is anything to go by! At the time of writing these only cover weekly regular bonuses (the casino is literally brand new). I will come back to this page and update you as soon as we find out what kind of deals will be in place. One thing we can already be sure of is the Ignition Casino loyalty scheme – which has 8 distinct levels each with a different type of metal or gem attached to the car keys. These start at ‘Steel’ and go all the way up to ‘Diamond’. You only need to hit the 3rd level before a $50 free chip and monthly bonus draw kick in. At the silver level and above you will start to receive weekly cash back rewards as well as bigger free chips. If you make it to the top level (diamond) then you will have a personal VIP host and some very exclusive rewards. If the Bovada Red Room is anything to go by, these will be among the best in the casino industry. Bitcoin features in the left hand navigation menu of this casino. This has now become a very easy deposit and withdrawal option. If you do not have a BitCoin wallet then maybe the Ignition Casino is the perfect excuse to get that set up. There is even a video on the site explaining the process. I am working under the assumption that more traditional payment options are also available – and that these match the Bovada list. This will include Visa, MasterCard, money transfer (wires via Western Union for example), and prepaid Visa cards. Bovada has a great reputation when it comes to accepting payments and finding a method that works for you. I fully expect Ignition to follow suit. Withdrawals are usually by paper check, with a free one couriered to your door each month. Banks will accept these without any issues. This is a fresh new casino which has very solid ownership behind it – making Ignition a welcome addition to the list of US friendly casinos. The stand out for me is the 60% weighting for table games in clearing the initial bonus. Outside of this you have a smart interface, plenty of games from both RTG and Rival Gaming – and a very generous 8-tier rewards scheme. If you are from the US, check out Ignition Casino for yourself now at www.ignitioncasino.eu!